کاظم زاده, عزت اله, ولی, جعفر, آلوکی بختیاری, حسام. (769). ارتباط تراکم‌‌پذیری منافذ با ضریب سیمان‌‌شدگی با هدف تأثیر بافت و نوع تخلخل در سنگ‌های کربناته. مجله ژئوفیزیک ایران, 3(1), 45-57. عزت اله کاظم زاده; جعفر ولی; حسام آلوکی بختیاری. "ارتباط تراکم‌‌پذیری منافذ با ضریب سیمان‌‌شدگی با هدف تأثیر بافت و نوع تخلخل در سنگ‌های کربناته". مجله ژئوفیزیک ایران, 3, 1, 769, 45-57. کاظم زاده, عزت اله, ولی, جعفر, آلوکی بختیاری, حسام. (769). 'ارتباط تراکم‌‌پذیری منافذ با ضریب سیمان‌‌شدگی با هدف تأثیر بافت و نوع تخلخل در سنگ‌های کربناته', مجله ژئوفیزیک ایران, 3(1), pp. 45-57. کاظم زاده, عزت اله, ولی, جعفر, آلوکی بختیاری, حسام. ارتباط تراکم‌‌پذیری منافذ با ضریب سیمان‌‌شدگی با هدف تأثیر بافت و نوع تخلخل در سنگ‌های کربناته. 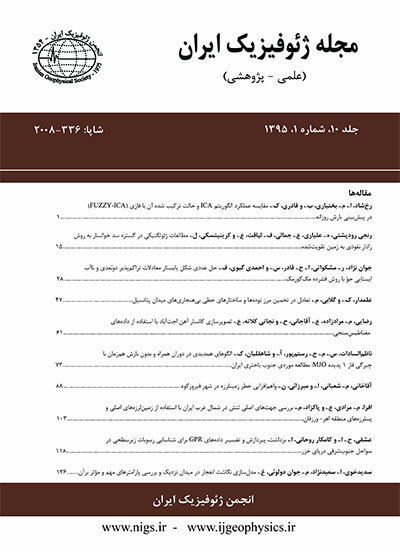 مجله ژئوفیزیک ایران, 769; 3(1): 45-57. در این تحقیق تأثیر بافت و نوع تخلخل نمونه‌ سنگ‌های مخزن کربناته در تراکم‌پذیری (عکس مدول بالک) و همچنین ارتباط بین تراکم‌پذیری نمونه‌ها با ضریب سیمان‌‌شدگی مورد بررسی قرار گرفته است. بدین منظور تعداد 90 نمونه استوانه‌ای (پلاگ) از سنگ‌های کربناته میدان نفتی در ناحیه جنوب غرب ایران تهیه شد. بررسی تصاویرسی‌تی‌اسکن و مقاطع نازک میکروسکوپی به‌منظور تعیین نوع کانی، نوع بافت و تخلخل صورت گرفته است. بررسی‌های زمین‌شناسی روی نمونه‌ها نشان دهنده آن است که فراوان‌ترین بافت در سنگ‌‌ها دولوستون و بیشترین تخلخل نیز مربوط به نمونه‌های دارای تخلخل حفره‌ای بوده ‌است. در این تحقیق نمودارهای ضریب سیمان‌شدگی بر حسب تراکم‌پذیری منافذ برای انواع تخلخل و بافت نمونه‌های کربناته مورد بررسی قرار گرفته است. نتایج نشان می‌دهد که با افزایش تخلخل و یا با تغییر بافت از دولستون ماسه‌ای به مادستون، تراکم‌پذیری کاهش می‌یابد. همچنین با افزایش فشار مؤثر، تراکم‌پذیری کاهش و ضریب سیمان‌شدگی افزایش می‌یابد. همچنین تغییرات تراکم‌پذیری منافذ در نمونه‌های دارای ضریب سیمان‌شدگی کم، بیشتر از نمونه‌های با ضریب سیمان‌شدگی زیاد است. Pore volume compressibility, which is the reverse of bulk modulus, is one of the most important and effective parameters of mechanical, seismic and reservoir properties of hydrocarbon reservoirs. The investigation of elastic modulus is essential for using geophysical data in reservoir production and EOR. In order to determine the pore compressibility of Asmari carbonate reservoir rocks, a total of 90 samples from different types of carbonate rocks were selected from oil reservoir for this study. Petrographical analyses were conducted to determine the effect of textures; type and value of porosity on pore compressibility, and then the effect of net confining pressure and pore compressibility on the Archie cementation coefficient was studied. To achieve this purpose, after geological examinations and grouping the samples based on type of textures and pores, the relationships between cementation coefficient and pore compressibility were calculated. Pore compressibility experiments as well as the determination of the cementation factor were performed using the “Overburden FRF Rig” apparatus. Hydrostatic pressure up to 10000 psi may be applied to samples via this apparatus. The sample that is fully reservoir brine saturated is located in a rubber sleeve of hydrostatic core holder and surrounded by two rings. After purging the system, the confining pressure was increased from 435 psi up to 4000 psi. The increase of pressure on rocks causes pore compaction and expels the fluid from the sample. The volume of fluid expelled from the samples shows the volume of pore volume reduction due to the increase of pressure. Pore compressibility was determined by derivation of each pressure point by plotting the logarithm of variation of pore volume reduction vs. effective confining pressure. In order to study pore compressibility under hydrostatic pressure, five steps of increasing the net pressure, which were 435, 1000, 2000, 3000 and 4000 psi, were selected. Pore compressibility is a function of porosity and it increases as porosity decreases. The power function, expressed as Cp = a(P)b , usually shows the best fit for the compressibility and net pressure relationship. The results of this study show that for almost all of the selected samples, the cementation factor increases when the pressure is increased. The compaction of rocks causes changes in the structure of the pores and grain shapes, and reduces the pore volumes. In a few of the samples, increasing the pressure caused a reduction in the cementation factor. The main reason for this reduction could be due to damage to the structure of the rocks. Two main differences were observed between the changes in compressibility and cementation factor: (1) by increasing compressibility, the reduction of the cementation factor is accelerated in samples with a higher cementation factor and (2) changes of pore compressibility are higher for samples with a lower cementation factor. 1) The slope of curve increased in a cross plot of the measures of cementation coefficient vs. compressibility due to a change in texture from packestone to dolopackstone and dolostone. 2) Increasing the net confining pressure increases cementation factor. 3) Variation of pore compressibility is higher in the samples with lower a cementation factor. 4) The cementation factor is reduced by an increase of pore compressibility, and reduction of cementation factor occurred faster in the samples with a higher cementation factor. 5) In the investigated formation, the value of pore compressibility is dependent on the texture, type and value of porosity. 6) Pore compressibility is higher in sandy dolostone with porosity measuring less than 15 percent compared to other carbonate textures, and it decreases with change in texture from sandy dolostone to mudstone. A power function in the form of Cp = a(P)b usually shows the best fit for compressibility and the net confining pressure relationship.